Are you thinking of having a swimming pool installed in your backyard, but you don’t want to deal with a messy and complicated pool installation? A lot of people think it takes forever to have a swimming pool installed and that their property will be a disaster for many months during the installation process. This is simply not the case anymore. An experienced pool installation company can have your pool designed and installed quickly and in an orderly fashion, so you don’t have to deal with the headache of a messy and long installation process. Swimming pool installation can actually be very fun. First, you want to decide on a design for your swimming pool. You need to know what shape and size will fit in your yard. A pool design professional can help you with this process, so the swimming pool will look like it has always been there. You can also pick out different design elements like water features, beautiful tile, and a classy stamped concrete pool deck. All of these elements can add class and style to your property and will turn your backyard into your own personal oasis. You can also incorporate different plants and foliage into the pool design to make it really look wonderful. 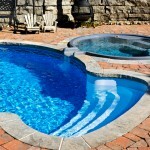 If you are interested in quality pool installation, contact us today at Lake Norman Signature Pools & Patios. We will work closely with you during every step of the design and installation process to make sure we are doing everything we can to turn your vision for your swimming pool into a reality. We work quickly and efficiently, so you are not in a mess for longer than necessary. You can relax and enjoy watching your design take shape. You will be swimming and lounging poolside before you know it!